A new front on protectionism has opened up in policymaking circles, with Chinese manufacturing being used as a pretext to raise trade barriers. This column presents the new Global Trade Alert report which challenges the empirical and conceptual basis for doing so. During the past year some of the US’s trading partners have sought to rein in Washington’s unilateral protectionist instincts by framing the woes of the trading system in terms of global excess capacity – essentially diplomatic code for Chinese excess capacity in manufactures. The joint EU, Japanese, and US statement pledging cooperation on such matters at last December’s WTO Ministerial Conference was an important milestone in this co-option strategy (Financial Times 2017). In light of the threatened imposition of tariffs on steel and aluminium products on widely derided national security grounds, the latest Global Trade Alert report examines whether the US’s trading partners should double down on this particular co-option strategy (Evenett and Fritz 2018). To do so, we evaluate whether excess capacity in manufactured goods is a systemic threat to the world trading system. We conclude there is no compelling case for governments going spare over global excess capacity in manufacturing. From the perspective of the global trading system, a nation’s excess production capacity is not the issue per se, but the harm such excess capacity does to trading partners is. We build our case first by critically evaluating the implementation of the only G20 initiative to tackle sectoral excess capacity, namely, in the steel sector. The dissatisfaction of key steel sector stakeholders with this initiative’s execution is merited. That the steel sector is plagued by trade distortions is not in question, how the G20 has gone about tackling it is. Then we muster empirical evidence that sheds light on how little global trade is in sectors where China has excess capacity. Moreover, exports from these sectors account for only a small share of China’s total exports. 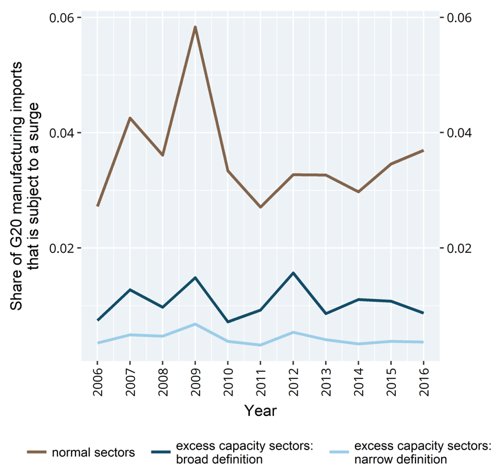 Critically we show how systemically unimportant are the trade-related knock-on effects of excess capacity such as import surges and how infrequently G20 governments have bothered to respond to trade disruption in excess capacity sectors during the past 10 years. In assessing the impact of the Global Forum on Steel Excess Capacity it is worth noting that world steel prices had risen 50% from their nadir before the Forum’s terms of reference were agreed in December 2016. Still, compared to the G20’s initiative on protectionism, this Global Forum represents one step forward and several steps back. The advance came in recognising that a wide range of government policies distort steel trade, going well beyond the narrow range of policies mentioned in the original G20 pledge on protectionism. The problems arose, however, as G20 members balked at the implications of this for monitoring policy choice and for designing a steel excess capacity reduction plan with teeth. One failing of the G20 steel forum is that it relied on member governments to report on their own policy interventions. Consequently, G20 governments grossly under-reported their own resort to antidumping actions, anti-subsidy tariffs, subsidies and export incentives granted, and other import tariff increases in the steel sector. In addition to being woefully incomplete, the November 2017 Global Forum report failed to provide any national and global statistics on policy choice. In contrast, our report includes member-by-member data on policies used in the steel sector (in Chapter 5) as well as data (in the annex) on the contribution of each member to global steel overcapacity as the share of their steel imports and exports that face trade distortions. We also show that resort to trade distortions in the steel sector surged in 2014-6, even after stripping out trade remedy cases. By 2017 such was the build-up of trade distortions in the steel sector that only 30% of steel exports from Global Forum members competed on a level playing field (Figure 1). Many steel exporters face multiple trade distortions when competing in foreign markets – on that the critics are right. Nearly 60% of Global Forum steel exports compete in foreign markets against rivals benefiting from state-provided export incentives. Even if the latter are excluded, the cumulative effect of remaining trade distortions – including bailouts for steel firms and local sourcing rules for steel – still covers half of steel exports in 2017 (Figure 1). We used corporate financial statements to shed light on differences in performance of publicly listed Chinese and non-Chinese steelmakers and their potential receipt of state largesse. Median profit margins differ little between steelmakers in China and abroad and there is no clear pattern of higher world steel prices favouring Chinese firms over rivals. In 2017 that was the case, but the opposite was true during comparable steel prices in 2010 and 2011. Moreover, as far as profit margins are concerned, it is hard to see how publicly listed Chinese steelmakers were punished by the foreign government measures of recent years. Chinese steel capacity reduction is likely the driver of higher profit margins. More telling is the sizeable narrowing of the gap between the gross and operating margins of Chinese firms and their foreign rivals and no narrowing in differences between their operating margins and pre-tax profit margins. The former finding implies that Chinese steelmakers benefited from a more generous depreciation and allowances regime than foreign rivals. The latter finding suggests that differential access to cheap credit was not a driver of profit margin performance, contrary to much conventional wisdom. Analysis of the financial reports of publicly listed firms also showed that from 2008 on, government subsidies to Chinese steelmakers rose sharply, reaching nearly one billion US dollars in 2015. These subsidies never exceeded 1% of the firms’ revenues but, given profit margins are so thin in this sector, this largesse likely prevented some Chinese steelmakers from making losses. Subsidies and tax breaks reported in recent years by listed non-Chinese steelmakers are skewed towards Tata Steel and the Steel Authority of India. If there is any merit in focusing on excess capacity it is because of the cross-border harm that it does to trading partners. With that in mind, we summarise our findings about the global significance of trade in sectors where there is Chinese excess capacity. Using both a narrow and a broad definition of the sectors where China is thought to have excess capacity, we found that from 2005 on no more than 21% of world trade was in these sectors. That percentage has been falling since 2011 to 18% in 2016, just as G20 policymaker interest in this matter has been rising! Moreover, the percentage of total Chinese exports shipped worldwide where China has excess capacity peaked at 18% in 2008 and has declined since to 15.8% in 2016, the last year for which a full set of international trade data is available (Figure 2). When Chinese exports to the rest of the G20 are considered the 2016 percentage falls from 15.8% to 14%, suggesting that six-sevenths of Chinese exports are in sectors where excess capacity is not a problem. We also found that each year less than 2% of the total G20 manufacturing imports are affected by import surges in sectors where China has excess capacity – and this statistic includes import surges originating in those sectors outside of China (Figure 3). Meanwhile, the corresponding percentage for sectors where China does not have excess capacity has risen since 2011 to nearly 4%. As far as import surges are concerned, sectors with Chinese excess capacity actually generate less disruption to G20 manufacturing trade. Furthermore, China’s share of G20 imports affected by import surges is smaller in sectors where China does have excess capacity, a finding that stands even if the foreign markets where China is blocked by trade remedy actions are taken into account. Governments worried about the political pain of import surges should not focus exclusively on sectors where China has excess capacity sectors. Our last, and perhaps most surprising, piece of evidence relates to the frequency with which G20 governments respond to import surges by raising import barriers or granting subsidies to domestic firms. For import surges lasting one year, G20 governments react by raising import barriers 3.6% of the time in sectors where there is no Chinese excess capacity. In contrast, in sectors with Chinese excess capacity import barriers are raised 5.0% of the time. That means that only in one case in twenty have G20 governments reacted to year-long import surges in Chinese excess capacity sectors by raising trade barriers. 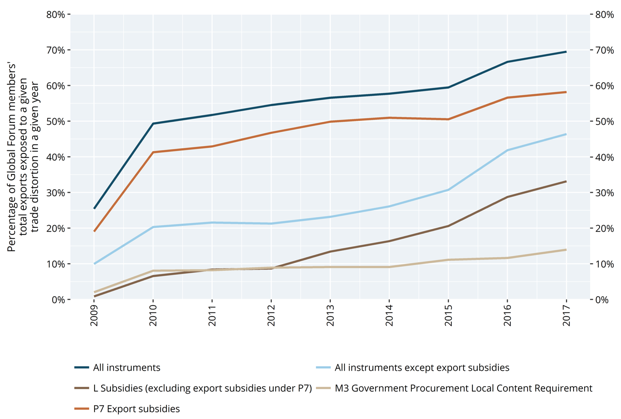 Granting subsidies in response to import surges occurs even less often. For two year-long import surges only one in ten import surges in sectors with Chinese excess capacity induces an import-restricting policy response by G20 governments. That over the past decade G20 governments reacted so rarely to import surges in excess capacity sectors undercuts their trade policymakers’ contention that excess capacity is a systemic concern. On examination, it turns out that the phrase excess capacity is slippery – rhetorically useful, but hard to pin down, even harder to operationalise, and at the same time woefully misleading. So excess capacity joins the list of superficially appealing trade policy jargon such as unfair trade and managed trade. A focus on excess capacity in some manufacturing sectors ignores the trade policy challenges building up in other sectors of the world economy. 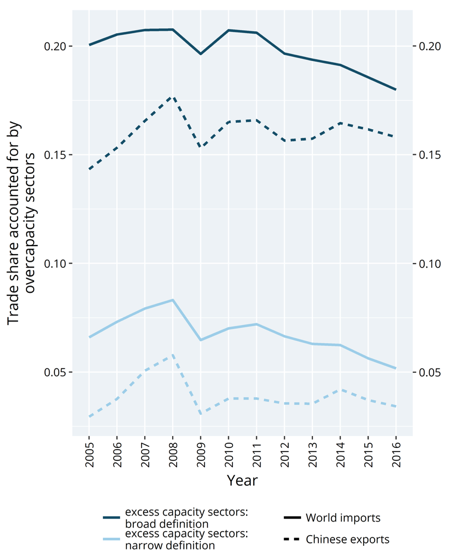 Framing future trade cooperation in terms of global excess capacity isn’t the way forward. The focus should be on the altering policies that distort commerce not targeting market outcomes, of which excess capacity is one. Evenett, S J and J Fritz (2018), Going Spare: Steel, Excess Capacity, and Protectionism, The 22nd Global Trade Alert Report, CEPR Press. Financial Times (2017), “EU, Japan and US to ramp up trade pressure on China”, 12 December.